The iPod touch is a multipurpose mobile device that provides easy access to text, images, media, and an enormous library of free and low-cost educational apps. The mobility and relative affordability of an iPod provides opportunities for students with assistive learning needs to succeed in the classroom using technology that was previously limited to a computer, was difficult to use, and expensive. The iPod's touch screen interface reduces anxiety for students by empowering them to quickly master essential tools that facilitate learning and engagement. 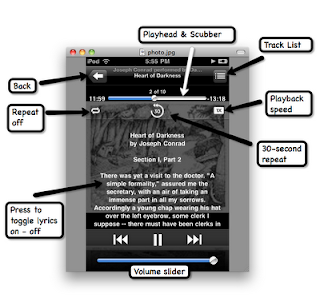 Using a combination of free or low-cost applications the iPod touch can be transformed into a video player, audiobook player (with or without text), voice recorder for recording lectures, specialized e-text reader, text-to-speech converter, speech dictation device, sound amplifier, and online reader of reference materials. Aside from its obvious use as a stand-alone mobile device, the iPod is an ideal companion for a laptop or desktop computer because of its portability, touch screen interface, and on-the-go access. Listed below are a number of scenarios that provide opportunities for students to improve their success in the classroom. Except for the lack of a built-in camera and cell phone capability, an iPod touch connected to a Wi-Fi network and equipped with an optional microphone is closely functional to an iPhone — without the monthly wireless costs. Refer to the section Microphones for a listing of recommended iPod microphones. There are a number of iPod touch microphones available, varying in quality and price - some up to $40 each. I have tried these low-cost mics with good success. For under $2.00 at Amazon the Mini Capsule Microphone is of surprisingly high quality, although it’s really small and easy to misplace. Buy more than one. The $8.00 Headset Adapter + Microphone includes a 30" cable and clip-on mic that claims to work with the 1G iPod Touch in addition to the newer 2G-3G models. Plug in a stereo headset and you have a hands-free speaking and listening device - really handy when carrying on phone conversations with Skype. http://edcommunity.apple.com/ali/story.php?itemID=16472 - choose iPod touch for Meeting the Needs of Special Learners. Very informative and well written post! Quite interesting and nice topic chosen for the post Nice Post keep it up.Excellent post.I want to thank you for this informative post. I really appreciate sharing this great post. Keep up your work.